This article is written by Cris Evert B. Lato-Ruffolo and was originally posted at http://cebudailynews.inquirer.net/186217/lost-bookstores-downtown-cebu. The former location (left) of Book O’Bar now houses a laundrymat. There was a time in the past when downtown Cebu was a destination for bibliophiles and bookworms. The bookstores did not boost of air-conditioned spaces or nooks that sold macchiato or cappuccino. They were plain and simple. 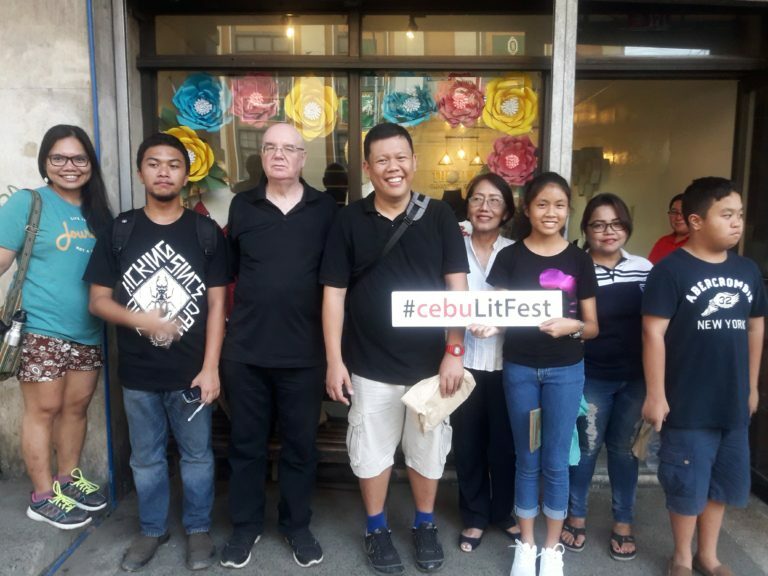 Most of them were situated on Cebu’s busy commercial district—near and around Colon street—and were literary destinations for families and students. Super Bookstore along with the newsrooms of The Freeman and Sun.Star. We also passed by the spots where the famous department stores, Gaw’s and Rosita’s were located. On the day of the walk, Hendri and I were joined by a couple and a student. It was a small group, an ideal size for the first attempt to jumpstart a series of citizen-led walks in Cebu. taytayan (bridge) of Gaisano Main where Cebu Music House once stand. We headed straight to the former location of Gaisano Super Bookstore, now an empty warehouse with a guard and a man selling cigarettes. We crossed the street heading to the University of the Visayas. Hendri asked us to look up at the edifice near the Manila Bulletin office. We were told that abandoned building was once a hospital. We turned left to Sanciangko Street then right to Junquera Street. We entered the V-Hire terminal to pass by Barangay Kamagayan which had a notorious reputation of being Cebu City’s red light district. The Kamagayan of my college years, between 2003 to 2007, is a far cry from the Kamagayan I visited in that walk. There is a Day Care Center now and a building is under construction to become an improved space for barangay officials and residents to meet and discuss issues and implement projects with partners. Exiting Barangay Kamagayan brought us back to Jakosalem Street. We walked to the direction of P. Del Rosario St., crossed the road and turned left to the direction of the University of San Carlos. We visited the Sun.Star newsroom and was welcomed by editor-in-chief Isolde Amante. From Sun.Star, we passed by Elicon House, crossed the street again to get to the downtown branch of La Belle Aurore, which closed shop in early 2013. Before we called it a day, we stopped by the former location of Goodwill Bookstore just across the University of San Carlos Downtown where the family of lawyer and Book Swap Cebu founder Chappy Piramide shared stories of their bookstores and printing press. We walked to Cup N Saucer Restaurant on Pelaez Street for snacks of binignit and avocado shake and called it a day. We started the walk at 3:30 p.m. and ended before 5 p.m.
For all the stories I heard that day, I wished more people joined us. Then again, there is Jane’s Walk 2019.